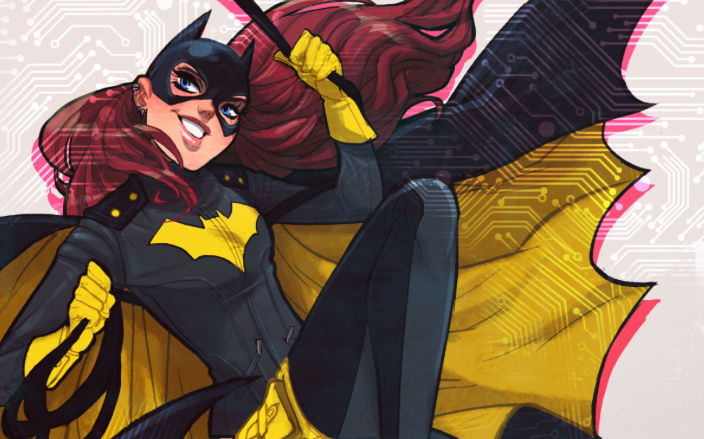 DC Comics announced Thursday that a new creative team will be taking over the Batgirl comic this October. The new storyline has Barbara Gordon losing everything in a fire, forcing her to start completely from scratch, including her costume. 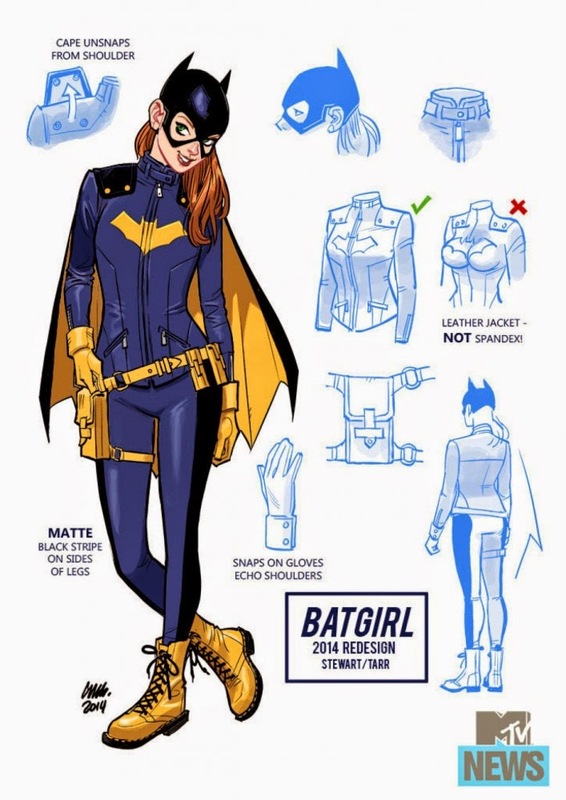 Following Gail Simone's departure from the Batgirl comics for an unannounced DC project, the new creative team, which consists of co-writers Brenden Fletcher (Wednesday Comics) and Cameron Stewart (Batman Inc.) alongside rising artist Babs Tarr, will take over the storyline this October starting with Batgirl #35, amping up the superhereoine's costume and moving her into a Brooklyn-esque neighborhood. In a series of standalone, single-issue stories that will be connected by a longer story arc, Batgirl will stand on her own to take on a variety of new villains (her first task is a sleazy Internet blackmailer). Barbara assembles her new costume herself, modifying clothing from thrift stores that "reflects her youth and style," Stewart mentioned in an interview with MTV News. Featuring leather instead of spandex, it dons a snap-off cape and snapped gloves and what looks like yellow Doc Martins. "Unlike Batman or Batwoman, she no longer needs to stay in the shadows, and in fact learns to embrace the spotlight." 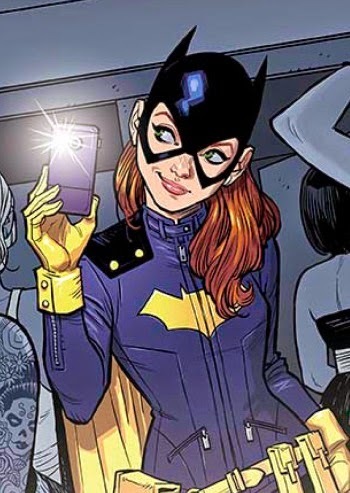 Fletcher and Stewart stated that Batgirl deserved a break from crime fighting and needed a change to focus on graduate school. Batgirl has really been put through the wringer in recent years—after being attacked and paralyzed by the Joker, her brother turning out to be a serial murderer, the trauma of her family breaking apart and the series of gruesome villains she's had to contend with, we figured she deserved a break from all that. Just prior to the start of our story she's pushed to the breaking point and decides that she'd had it with misery and darkness and wants a change. She wants the opportunity to have some fun and live the life of a young, single girl in the city, so she packs up and moves to Burnside, the cool, trendy borough of Gotham, to focus on grad school. Lets fight crime, but first, let me take a selfie! Fletcher described Burnside as the part of Gotham City known for expensive coffee, fixie bikes, vintage shops, and breakout bands (so, you mean Williamsburg?). "Barbara allows herself to be immersed in youth culture for the first time, exploring the social side of life in Burnside," Fletcher told MTV. "That's not to say there isn't mystery, of course! Try as she might to live a 'normal' life, Barbara very quickly finds herself drawn back into the world of crime fighting." Their take on Babs, which was said will have a lighter tone of fun, adventure, and mystery, will mix the best elements from Veronica Mars, Girls, and Sherlock, leaving the rest of the Bat-family to deal with the darkness. As far as featuring other Gotham super-residents, Stewart said that aside from those Barbara was formerly close with, the new comic is a clean break, meaning don't expect Nightwing or Poison Ivy to make an appearance any time soon. Batgirl #35 will be on sale on October 8. Check out the full synopsis below. Barbara Gordon is no stranger to dusting herself off when disaster strikes…so when a fire destroys everything she owned, she spots the opportunity for a new lease one life—and seizes it! Following the rest of Gotham's young adults to the hip border district of Burnside, Barbara sets about building and all-new Batgirl…and discovers all-new threats preying on her peers! It's a re-invention of Batgirl from the boots up, by the incredible creative team of Cameron Stewart (BATMAN INC.), Brenden Fletcher (WEDNESDAY COMICS), and rising start artist Babs Tarr! What do you think of the redesigned costume and new storyline? It's definitely intriguing, to say the least, though it really plays on the hipster style that goes with the neighborhood that's reminiscent of Williamsburg. Let us know what you think in the comment section below.